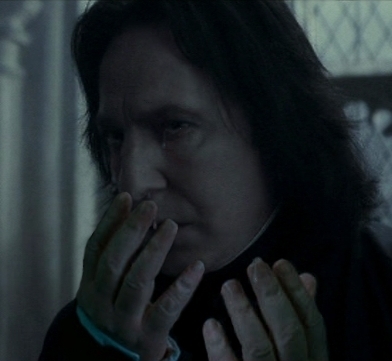 Crying Snape (with hands). . Wallpaper and background images in the Severus Snape club tagged: proffesor severus snape alan rickman harry potter half-blood prince. D: Where is this from?! The head is from the Sectumsempra scene, the hands are from two screenshots from the last Occlumency scene (one mirrored) and the rest is by me and my GIMP program. I had to adjust the colours and sizes, make the tears (trickiest part..) and some slight changes like making the eyes look puffy and the frown a bit deeper. come here and let me dry your tears.